As regular readers will have twigged by now, I’m interested in how the demise of DBM, and the advent of Field of Glory and DBMM, has affected the wargaming scene in the UK in general and in the Northern League in particular. I started doing this whilst I still played DBMM; I now play Field of Glory. I really wanted to provide some hard data to inform the rules debate rather than the soft, opinion based data that you find so often on lists and forums. So far I’ve used two sets of player registration data: the Northern League figures and registrations at the big four UK competitions. There’s no data for 2004 because the ranking system underwent a one-year change that skewed the figures for that year. The figures for 2007 are affected by the desertion of DBM for the FOG beta programme competitions which weren’t included in the rankings. Post 2007 it’s perfectly possible for a player to have a ranking in all three rule sets. So from 2007 on the totals have to be treated with some care. DBM was in decline from its peak in 2002, five years before the advent of DBMM. The decline was hastened by the launch of Field of Glory in 2008. Field of Glory’s popularity was quickly established; far quicker than DBMM which launched first. Even FOG’s 2007 beta programme had an effect on DBM rankings. Since 2008, Field of Glory has been by far the most popular rule set for ranking competitions but it has yet to match DBM. The average number of GB competition players is 470 for the period 1999-2010. I estimate the average figure would be 6-10 higher if there were any rankings for the 2007 FOG beta programme. 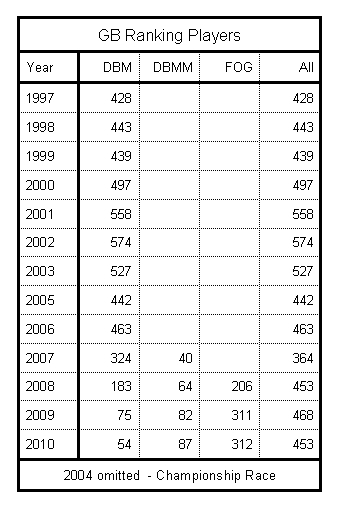 1997 - 2002 saw a steady increase in participation peaking at 574 players: up 34% from 1997. This was followed by a sharper decline in 2003 - 05 to 463 players: a fall of 20%. 2006 saw some improvement and since then, excluding 2007, the numbers have remained relatively stable at around the 450 to 470 mark. The advent of FOG in 2007 does appear to have arrested the decline in total numbers. However, neither DBMM, FOG or the two combined has proved popular enough to attract sufficient players to match the peak of 574 ranking players seen with DBM in 2002. I think this data set adds to the overall picture of the GB scene. Moreover it neatly documents how DBM strengthened the GB competition circuit in the late 90s and shows the size of the challenge still facing DBMM and Field of Glory in attracting players to ranking competitions. It will interesting to see what 2011 brings.